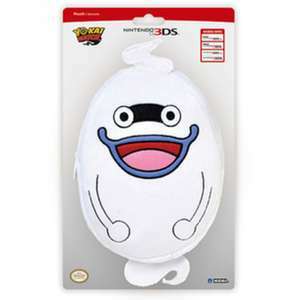 Store and transport your New Nintendo 3DS XL, Nintendo 3DS XL, or Nintendo 3DS system in this soft plush pouch in the shape of Yo-kai Watch's Whisper. Featuring an inner pocket to store game cards and accessories, an easy-to-open zipper, and a colorful embroidered design, this case is both cute and functional! Officially licensed by Nintendo and Level-5. Haha I love this. I'm going to order one. heeeeaaaaaaaaat.